MSI reveals its latest GX60 gaming laptop with AMD Radeon HD 7970M graphics and Eyefinity support. The 15.6" laptop offers a 1920 x 1080 pixel screen and features the AMD A10-series APUs, up to 16GB DDR3 memory, SSD + HDD storage options, DVD burner or Blu-ray, a 720p HD webcam, SD/MMC memory card slit, Killer NIC Gigabit Ethernet, Bluetooth 4.0, 802.11b/g/n WiFi, and three USB 3.0 ports. 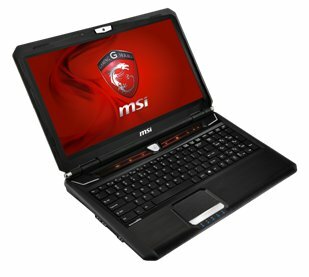 The MSI GX60 series will start shipping within two weeks with prices starting at 1199EUR. AMD has been leading graphics innovation with the AMD Radeon™ series of GPUs. Lately, we have been advancing state of the art of graphics technology with the AMD Radeon™ HD 7000M Series of notebook GPUs by providing uncompromising performance, immersive features, and intelligent battery life. Today MSI has partnered with AMD to launch a great new gaming notebook based on the HD 7000M Series of mobile graphics for incredible gaming at an affordable price. The MSI GX60 is equipped with an AMD A10 4600M Quad Core CPU, and the AMD Radeon™ HD 7970M GPU. The latter features the award-winning GCN Architecture for superior DirectX® 11 gaming and tremendous compute performance. In addition to this awesome core hardware, MSI has also installed a ton of features & technologies in the GX60 to create a perfect platform for gamers.